How many calories in Cucumber? See below, the Cucumber calories for the different serving sizes. We provide you with the Cucumber nutrition facts and the health benefits of Cucumber to help you to lose weight and eat a healthy diet. Cucumbers come in many shapes and sizes, from short stumpy varieties with spiky skin, to long smooth varieties. The Calories in Cucumber are very low. Also, they are very low in fat and contain many minerals and vitamins including thiamine (B1), riboflavin (B2), niacin (B3), pantothenic acid (B6), vitamin B6, folic acid and vitamin C.
Adding a few slices to your salads and sandwiches in season will do wonders to your health. Cucumbers contain silica with is said to improve your complexion. They are also useful for your eyes, reducing swelling, as they contain ascorbic acid and caffeic acid. 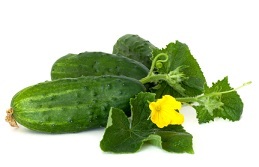 Cucumbers are also thought to lower blood pressure and bring meaning to the expression "as cool as a cucumber". Other Cucumber benefits include providing assistance with rheumatic conditions if you juice the vegetable. Below we have two calorie tables for this vegetable with or without skin. We also have a nutrition table. Compare the nutrition and calories in cucumber with the calories in other vegetable varieties. This avocado cucumber soup recipe can be made in just 5 min, no cooking involved. This recipe is good for lunch or as a snack. 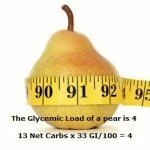 It is high in fiber, low in calories (197 kcal), low in carbs (4g of net carbs), glycemic index and cholesterol.